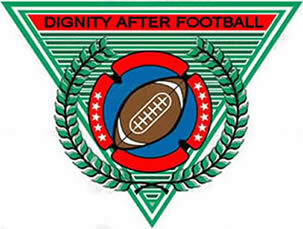 Dignity After Football is the organization whose purpose is to help guide and resolve the problems found in the lack of benefits, disability claims, same years for vesting across the board (3), and pension of the NFL. Educating our youth and youth sports coaches on dangers of head injuries. your part to help secure needed increases to retiree rights and benefits. advocate effectively for retired players. we don't have time to waste if we want decent benefits, fair disability, DIGNITY!! SEND RIGHT NOW, DON'T WASTE A MINUTE!